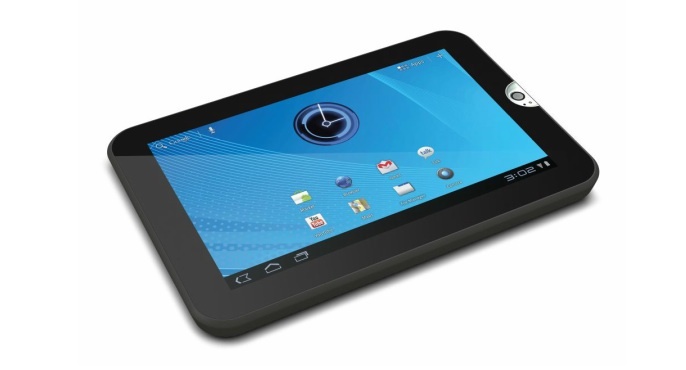 Unveiled back in September, the 7-inch version of Toshiba’s Thrive Android tablet is now available at retailers in 16GB and 32GB editions. Although Toshiba’s 10-inch Thrive tablet has been on the market since summer — and generally been criticized for a hefty build — the 7-inch slims down the unit’s form factor and weight (down to half an inch thick and 0.8 pounds) without compromising on features. The 7-inch version of the Thrive features a high-definition, 1,200 by 800-pixel LED-backlit touchscreen display, runs Android 3.2 Honeycomb, and is powered by a 1GHz Nvidia Tegra dual-core processor, meaning it can handle all Tegra-based entertainment apps and games for Android. The unit also features a 5-megapixel autofocus camera on the back, along with a 2-megapixel front-facing camera for video chat. There’s also a microSD slot for expanding storage, a micro HDMI port for pushing video or images to an HDTV, and a mini-USB port for sideloading. Naturally, the 7-inch Thrive features Wi-Fi and Bluetooth connectivity, along with built-in GPS. Toshiba has also comes loaded with software from Toshiba, whether that’s a boon or a downside depends on your perspective. Toshiba has packed its own media player onto the device, along with file management applications, Quickoffice, a bundle of games, and (tellingly) Kaspersky Tablet Security. One downside to the 7-inch Thrive might be price, especially as holiday deals mean other Android tablets are available cheap. Toshiba has priced the 16GB version at $379, with a 32GB version going for $429. That might be a hard sell with HP blowing out $99 TouchPads and Amazon pushing the Kindle Fire for $199.